CSI will be closed for voice communication on Tuesday, January 1st for the New Year's holiday. The host computer will be accessible for data retrieval as usual. All of us at CSI extend our best wishes for the season and the coming new year. The hallmarks of the CSI Data Retrieval Service have long been completeness and accuracy of the market data we supply. Regular subscribers have come to count on us for impeccable daily and historical coverage on world stocks, indices, options, foreign exchange, currencies, and all world futures. However, many CSI customers are unaware of our vastly expanded services that now include historical government fundamentals. This combination can turn your computer into a veritable data processing laboratory. Nearly 500 economic series on the U.S. economy are now reported each new day. They are generally quoted on a monthly frequency, but other periodicities exist. A sampling of the content includes civilian unemployment, civilian labor force, average U.S. hourly earnings, average weekly hours worked, five Consumer Price Indices (CPIs), import and export volume, an employment cost index, layoffs, unemployment claims, days of idleness, and information on labor work stoppages. Econometric fundamentals on a multitude of producer price indices (PPI), unemployment, national debt, etc. are also reported and appended to history files for all government series as updated information is released. CSI's fundamental data package reaches many years, and it is always current through the present day as of 4:00 P.M. eastern time. 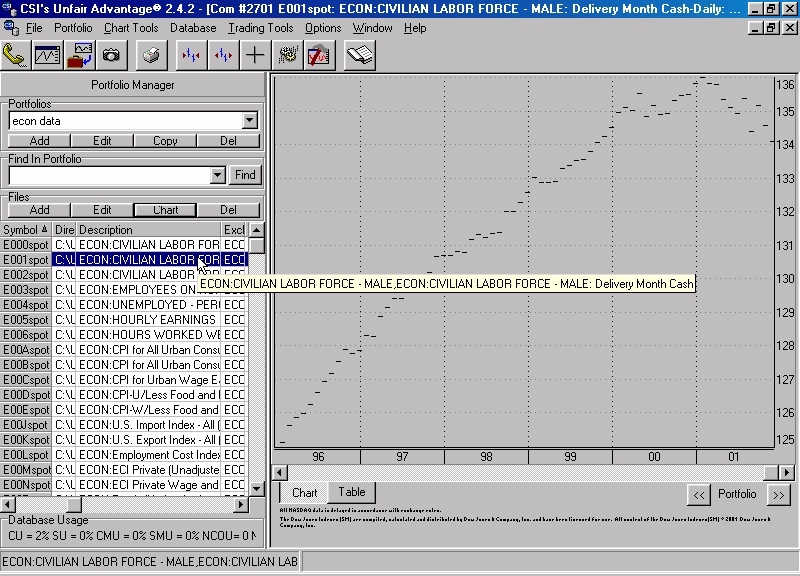 An Unfair Advantage® screen showing a sampling of available econometric series and a chart of Civilian Labor Force data. A preliminary version of Unfair Advantage's upcoming "Tomorrow's Daily Market Report" feature. Expect availability by the end of January. The next release of Unfair Advantage (version 2.4.4) will, early every evening, provide a quick preview of tomorrow's financial newspaper in an unabridged form. The Wall Street Journal, Investor's Business Daily and local newspapers show stock and futures prices for the prior day in a cryptic last-price/net-change form, leaving out the open, high, low and other substantive fields. CSI not only provides all of the coverage, but also adds in the earnings per share, the net change from yesterday, the open, high, low, and volume, and a six-month chart of historical progress on every listed future or security. All stocks are ranked by sector and by industry, yield and per-share earnings over the past 12 months. All of the pertinent columns reported by IBD or WSJ are also included in daily reports. Although CSI software has always allowed traders to observe or analyze historical data with just a few keystrokes, this new procedure further automates the process and relieves the user of initiating the individual studies. 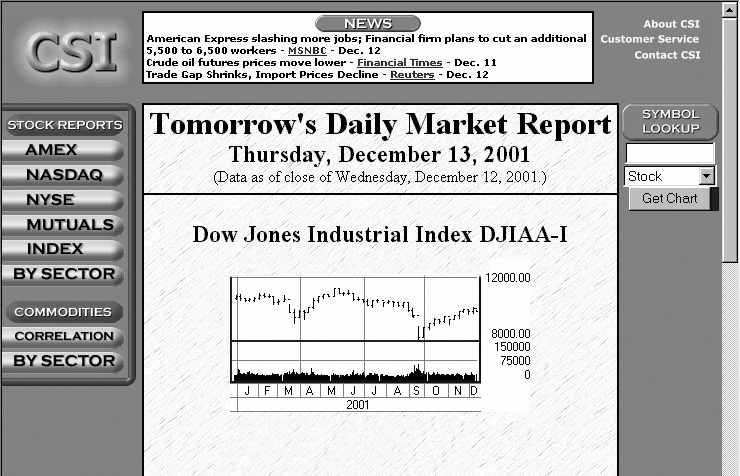 The newspaper format lays pertinent information before your eyes, using the computer screen instead of the newspaper to deliver the information. The advantages are many, including (first and foremost) that you're seeing tomorrow's paper today. This allows you to obtain an ever-current picture of market progress at all times. When you turn to Unfair Advantage to assist you with your trading pursuits, you will observe a convenient display much like the example at left. The introductory screen lets you scroll through charts of the major stock indexes and select your next area of interest. Simply click the buttons at left to choose a stock exchange, a broad listing of indexes or stock sectors or to view commodities grouped by correlation study results or by sector. For stocks, the next screen gives a newspaper-style listing of top stocks rated by volume, money flow and price change (major movers). For commodities, you can choose from among econometric fundamentals and futures market categories such as Food and Fiber, Financial Products, Grains, Energy, Metals, etc. Each entry includes full price information that, with the click of a mouse, can be supplemented by a chart mapping historical price development over time. There is no longer any reason to wait until tomorrow to review the market progress for today. UA will give you the necessary information today to make decisions for tomorrow, allowing sufficient time to consider the opportunities before you. CSI tracks nearly 1,000 world futures markets daily. The products are as diverse as world economies can offer. Information on products like Dried Cocoons from Japan, Pork Bellies from the U.S., Rubber from Malaysia and Rapeseed (Canola) from Canada may seem totally unrelated until you view CSI's revealing correlation study, which will be included in the Daily Market Report. This convenient study can now paint a picture of market correlations that may suggest enormous opportunities for future arbitrage profits. It clearly identifies market pairs that are highly positively correlated and those that are highly negatively correlated. Once this valuable study is run each trading day, the leading opportunities for trading off any one market with any other can easily be acted upon. For negatively correlated markets, the trader might decide to either buy both pair members or sell both members and potentially benefit from highly correlated tendencies to move in opposite directions. On the strength of the uncovered facts presented from viewing thousands of associated market pairs over more than a decade, the user can identify emerging opportunities that were not otherwise readily apparent. Check out the economy's fundamentals, the alternative investment opportunities for similar products and each candidate market's seasonal tendencies through UA's popular prepackaged studies. They give you added insight to discover which markets may support or oppose your trading plan. Once a trading plan is developed for active use, the UA user may easily paper test the hindsight record of performance and engage UA's Trading System Performance Evaluator.T It fosters an appreciation of the risks and prospects of achieving future profits. UA offers many tools like this that are just waiting for a chance to help. Another tool available to the futures trader is a provision for combining the entire history of ever-expiring futures contracts into a continuous series for each commodity. One of the specialized forms available include Perpetual Contract® Data. This is a time-weighted series used by the above correlation study that splices together expiring contracts over time. Others include back-adjusted contracts (which also combine real series by compensating for drops and jumps in price to produce a smoothed series of successive contracts. Gann contracts (concatenations of like delivery months from year to year), and Nth nearest future contracts (similarly spliced together as the Nth nearest contract expires over time). We are actively working on a forthcoming release of Unfair Advantage that will permit customers to scan all markets for opportunities, and to operate upon supplied market data with multiple interpreters such as though CSI's AnyLanguageT module. AnyLanguage comes with a software debugger that supports writing computer code in languages that include Basic, Fortran and another functional coding protocol with which the user may have prior knowledge. The planned AnyLanguage functionality is interpretive in style, and our software development efforts include a provision for locally reading and manipulating the enormous UA database. In addition, the newly popular Perl® language interpreter is available to UA users outside of AnyLanguage, where it is used primarily in the included MarketScannerT module. This scanner is regularly employed by investors to identify key trading opportunities in their own area of interest. Thank you for your continued patronage and friendship. As the new year begins, we will continue to strive for excellence in all we do for you. Commodity #690 has been reserved for an assortment of foreign currency rates (in U.S. dollars) that are to be available in Unfair Advantage v. 2.4.4. Please check the CSI website at www.csidata.com for information on downloading this new release.